March has come round so quickly and Spring is finally here; let’s hope for no more snow. 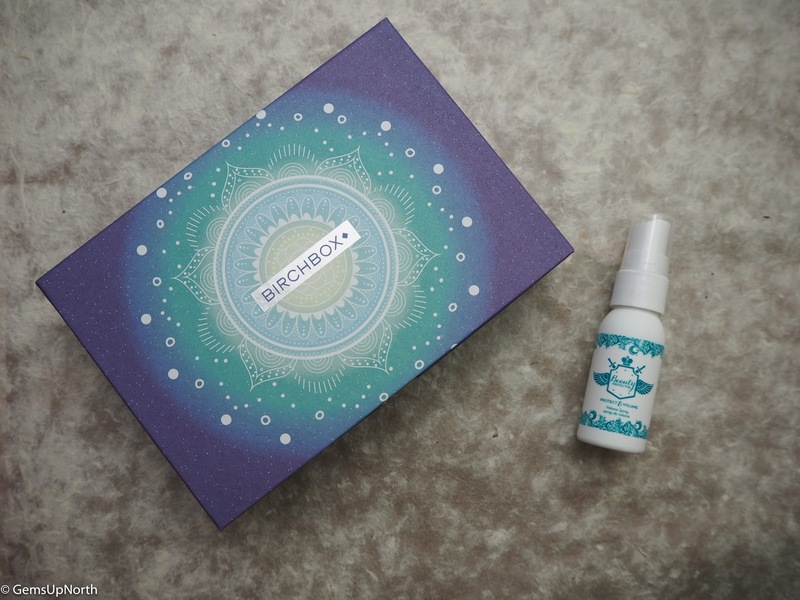 A new month means another Birchbox has been delivered and this month the box design was beautiful with a calming pattern on the top and spring colours creating all the well-being vibes we need this March! Included in the box this month was a Benefit treat, our choice of eye mask or face mask and 3 other items. I have to say I was already excited for this box because of the Benefit treat but the other items was also fun to sample and I've found a new hair care product that I love. My favourite item in this box this month! When Benefit announced the launch of this mascara I was eager to try it out and then Birchbox said there would be one to try in every March box I was super excited. The sample sizes from Benefit are always really good sizes and actually last ages plus they are perfect for in your handbag. Now I must admit it's taken me a little while to get used to this mascara as the formula is very wet so I feel like I have to wait for it to dry but only one application is needed to give me bold, long and blacker than black lashes! I am impressed by the long wand as it grabs each lash and coats them perfectly, its crazy how different my lashes look when wearing this mascara. I've also worn it with my Benefit Rollerlash mascara to get more curl on my lashes and this works fantastically. I will most definitely be purchasing a full size of this BadGal BANG! This is the item I choose to receive in my box this month, the choice was for a peel off mask or eye mask. I do love a good peel off mask and even more when it helps to unclog pores and helps with blemishes. My skin breaks out often so anything that can help me is a advantage for me and my skin. There was enough in this small tube for two applications and each time I used this mask my skin was left feeling soft to touch and clean! I felt fresh and like my skin had had a full on peel, the mask didn't have much of a scent and applied easily, the formula is a little sticky at first but spread across my face at ease especially after cleaning my skin first with a hot cloth. Top Tip - the thicker the mask the easier it is to peel off. This was a complete new discovery for me this month, I've never heard of the brand LAQA & CO before and was excited to try the blush & highlighter. 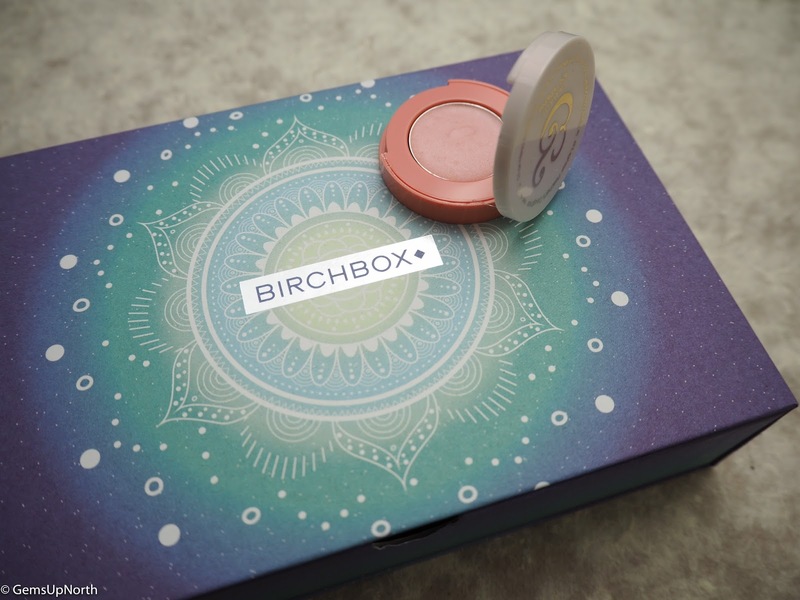 The packaging has gold text and feels a little glam, inside the compact is a sweet smelling peachy coloured balm. The cream product blends nicely with only applying using my finger and leaves a very pink shade; a little too pink for my skin tone. I think the cream could be used as a highlighter but more so as a blush because the shade is quite prominent. You could even get away with wearing this as a lipstick and it leaves a pinky glow on my lips. Beauty Protector has been featured in Birchbox a few times and I always like trying new products from them, this Protect & Volume is another winning product for me. First of all the sweet and fruity smell drew me in straight away and the lightweight texture on my hair was a plus. I've sprayed this onto damp hair before blow drying and found it does add volume and gives my hair the lift its needs. I'm already a fan of the Beauty Protector detangler spray and I'm now going to add this to my hair care routine permanently. The Protect & Volume is Vegan and Paraben-free too. Sleep sprays... 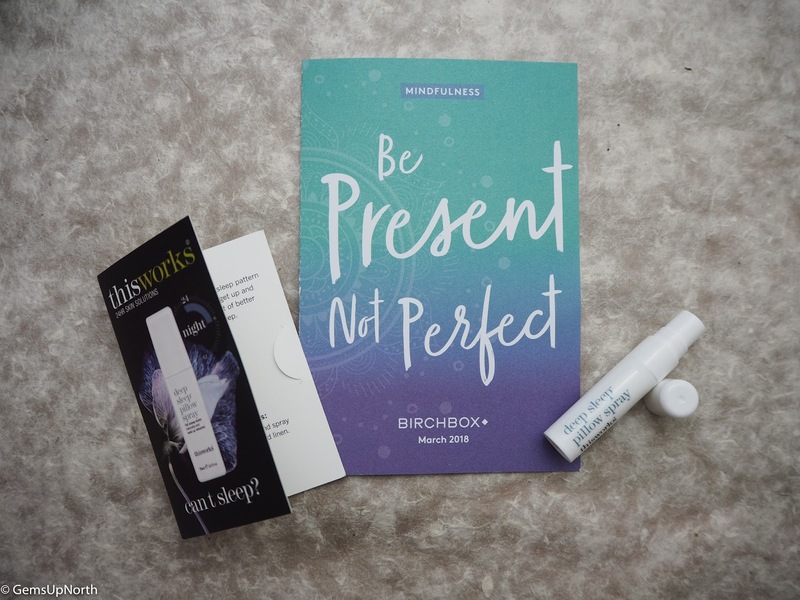 I've tried a couple of brands in the past including This Works and I find that they are helpful especially when going away or your an anxious sleeper. This tiny sample bottle is enough to do you a weekend away but if your wanting longer use from this you'll need a bigger bottle. I'm not the biggest fan of Lavender but do like Patchouli and I can just about smell this in this spray however the Lavender is quite over-powering. I will stick to my regular sleep spray. Now I had a bit of drama with my box this month and I’ve accidentally cancelled my subscription however I’ve contacted Birchbox and they have assured me that if I sign up before the end of the month I won’t lose my Birchbox VIP benefits and still won’t receive any duplicates. The customer service was excellent and I had an answer to my query within 24 hours and even quicker via Twitter. Next month Birchbox were treating us to a ModelCo Baked Highlighter and we get to pick the shade; Frose or Moonshine are the options. I've gone with the Frose shade as this looks a lot lighter than the other for my pale skin. Today is the last day to get your March box, you can grab £5.00 off your first box with my referral code by clicking here.